First Line: The overloaded luggage trolley bumped along the sidewalk, following Tricia Miles like an overgrown puppy. Tricia isn't sure how her sister Angelica did it, but she managed to win a weekend stay at Stoneham's new bed-and-breakfast, the Sheer Comfort Inn, and she insisted that Tricia come with her. Any thoughts of a relaxing night go right out the window when Tricia discovers the body of Pippa Comfort out in the flower bed. Now Tricia's boyfriend, Chief of Police Grant Baker, won't speak to her because she's involved in the investigation, the dead woman's husband is Tricia's first love who faked his own death twenty years ago, and she has yet to find an assistant to work with her at Haven't Got a Clue. Won't someone cut this bookstore owner some slack? This is one of those reviews that I find extremely difficult to write, and I'll tell you why. This is the sixth installment of the Booktown series that I've read. I love the setting that Lorna Barrett has created-- a small town in New Hampshire revitalized into a "booktown," filled with store owners who care for one another, help each other out, and work together to think of ways to keep the community thriving. This is a setting in which I could easily live. It also helps that the main character runs a store specializing in crime fiction, and this devoted dog person even likes Tricia's cat. I also enjoy the author's writing style and sense of humor. She creates intriguing mysteries that keep readers guessing chapter after chapter, peppered with scenes that can make you laugh out loud-- just like she's done here with Murder on the Half Shelf. She also has created characters that I've grown to care about, like the elderly couple Mr. and Mrs. Everett. However, it's several of those characters that have created a dilemma for me. I can-- and do-- read books that have characters I do not like, and as in real life, I simply deal with them and move on. 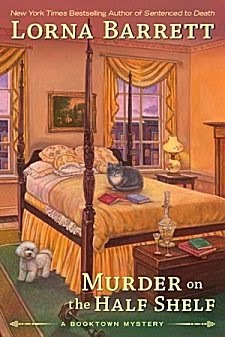 Many cozy mystery series seem to have that one character you'd just like to smack. The problem occurs when the number of characters you want to smack just keeps growing and growing. Sooner or later I reach a saturation point, and that is what has happened with the Booktown series. I like this author. She writes solid, enjoyable mysteries that I have enjoyed in the past, and just because I started having problems with this series does not in any size, shape or form mean that you should avoid reading them. However, I've come to the reluctant conclusion that it's time for me to leave Booktown. I'm not happy about it, but there it is. Fortunately Lorna Barrett (AKA L.L. Bartlett and Lorraine Bartlett) has other series that I can enjoy. Cathy - I understand exactly what you mean about saturation point. After a time, you want a larger group of characters you like. And if that doesn't happen, the series starts to be, well, a little less. I have to say though, I agree with you about Booktown. I could see myself in that kind of place too. I have to admit that I always think of the day I spent in Hay-on-Wye whenever I see a "Booktown" mystery by Barrett.